Medieval Engineers is all about using ye olden technology to build machines and structures in a physics-based world. That, of course, means that what is built can be destroyed, and that's really the hook for me. Building things may have socially redeeming value, but smashing them is where the fun is at. And the only thing more fun than smashing a sandcastle you've built is kicking in someone else's. Developer Marek Rosa clarified on his blog that the multiplayer component added in today's update isn't the new one that programmer Ondrej Petrzilka talked about in April, but is actually the same version of multiplayer that was in Keen Software's previous game, Space Engineers. The studio wanted to get some form of multiplayer working because the game is more fun with other people, he explained, adding that he expects it will see the player base "increase significantly." "[Multiplayer] supports all the features that are now in the game, in both Creative and Survival modes, building and destruction, structural integrity, mechanical parts, blueprints, mods, synchronized daytime and AI characters (barbarians, peasants and deer)," Rosa said. "In more simple words, you can do everything that is possible now in the single-player but with your friends." The latest update makes a few other changes to the game as well, including increased peasant health for better AI survivability, some new sounds, and a few bug fixes. Rosa said development of Medieval Engineers is "progressing at a good pace," and that there are now enough blocks in the game to enable the creation of just about any kind of structure. "Our programmers are focusing more on the survival mode and you should expect more survival based features in the upcoming weeks," he said. "Some of the most important are a battle system, melee fight, etc... Stay tuned!" To see more of what can be done (and undone) with Medieval Engineers, have a look at our collection of some of the best videos for learning how to create and destroy things in the game. 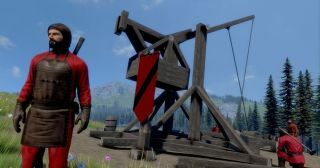 Medieval Engineers is available now on Steam Early Access.